Very cute - nice healthy alternative for saintly feasting. 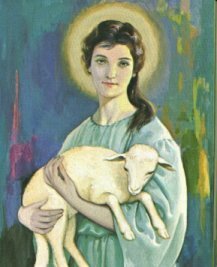 I've been searching for this image of St. Agnes in hopes of finding the original artist who painted it...do you know? It's quite beautiful, possibly my favorite of her. My daughter was born on her feast day, so she's special to us!